You prepare the dessert by pouring the mix into a microwavable 9-to-12-oz mug or cup and stirring in three tablespoons of water or milk and then setting it in the the microwave and cooking on high for about a minute. Betty Crocker Mug Treats come in boxes of four individually-portioned mixes plus four toppings. The suggested price per box is $2.99. You can find them at select stores now (Walmart, Meijer, HEB, and Wegman according to the Betty Crocker website) with a nationwide launch coming this summer. 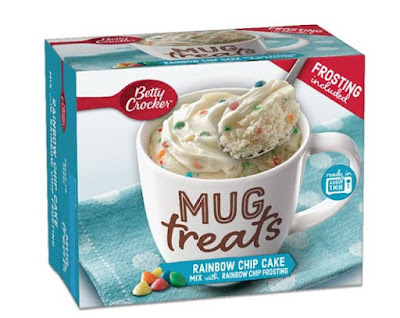 Mug Treats are basically Betty Crocker's answer to rival Duncan Hines Perfect Size for 1 desserts, which arrived last summer. Photo via Betty Crocker / General Mills.